Can The Tasty Drink Golden Milk Boost Your Health? Can this tasty antioxidant-rich brew stave off illness? All over the world, cafés are serving up a caffeine-free drink called golden milk. 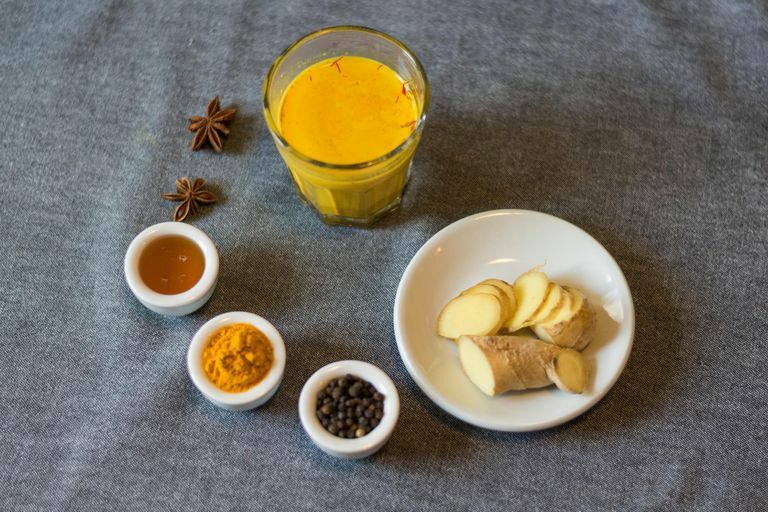 Also known as a “turmeric latte,” this antioxidant-packed concoction typically contains turmeric, ginger, black pepper, and almond milk or coconut milk. As one of today’s trendiest health drinks, golden milk is said to ease inflammation and enhance wellness from head to toe. With many enthusiasts hailing golden milk as an all-around health-booster, some suggest that the beverage offers such benefits as improved digestion and strengthened immune function. It’s also said that golden milk can shield liver health, fight heart disease, promote weight loss, reduce stress, and even protect against cancer. However, these claims have yet to be tested in scientific studies. Recipes for golden milk tend to vary, with some proponents adding such ingredients as coconut oil and cinnamon. Though it’s usually made with dried turmeric and ginger, you can also use fresh herbs. Long used in Ayurvedic medicine and in traditional Chinese medicine, turmeric is a key ingredient in curry powder. Turmeric contains curcumin, a compound found to reduce oxidative stress, which is a destructive process linked to many chronic diseases (including heart disease and cancer). Ginger has a long history of use in herbal medicine as well. Known for its anti-inflammatory effects, it’s often taken to alleviate inflammation-related pain. Why the black pepper? Research has demonstrated that piperine (a substance present in black pepper) can increase your body’s absorption of curcumin. In fact, health experts often recommend taking turmeric supplements in combination with piperine. If you don't like almond or coconut milk (or are allergic to nuts), try rice or hemp milk. To prepare your golden milk, heat two cups of either almond milk or coconut milk over medium heat, then stir in a teaspoon of turmeric, a half-teaspoon of ginger, and a pinch of black pepper. Continue heating the mixture until it’s hot but not yet boiling, then cover and let sit for about ten minutes. To sweeten your golden milk, you can add a sweetener such as honey or maple syrup. In some cases, golden milk is prepared by blending all ingredients until smooth, then heating that blend for about five minutes. So far, scientific studies haven’t explored the health effects of golden milk. Still, some research shows that both turmeric and ginger may protect against certain health problems. For instance, emerging research indicates that turmeric may help manage conditions like osteoarthritis and diabetes. Findings from preliminary studies also suggest that curcumin may help thwart the development of conditions such as Alzheimer’s disease. Like turmeric, ginger also appears to aid in arthritis control. What’s more, some studies have shown that ginger can help soothe the stomach and, in turn, treat common conditions like motion sickness and morning sickness. Although the herbs used in golden milk are generally considered safe when consumed in small amounts in food, they may have some side effects. For example, high doses or long-term use of turmeric may cause such issues as indigestion, nausea, or diarrhea, while ginger may trigger adverse effects like gas, bloating, heartburn, and nausea. People with gallstones or gallbladder disease shouldn't take turmeric. It should be noted that self-treating a chronic health problem with golden milk and avoiding or delaying standard care can have serious consequences. Many fans of golden milk note that sipping the brew just before bedtime helps promote relaxation and fend off sleep troubles such as insomnia. On the other hand, some golden-milk devotees prefer to drink up first thing in the morning to get a long-lasting energy lift without turning to caffeine. As an alternative to golden milk, you can also get ginger, turmeric, and black pepper by adding each spice to your stir-fries, soups, and vegetable dishes. National Center for Complementary and Integrative Health. “Ginger.” NCCIH Publication No. : D320. National Center for Complementary and Integrative Health. “Turmeric.” NCCIH Publication No. : D367.